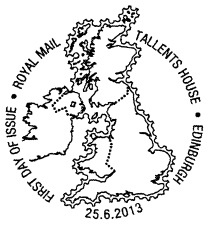 We're now able to show you the images for two sets of stamps to be issued in the summer. On 25 June the second set of 'Freshwater Life' Faststamps will be issued from (Wincor-Nixdorf) Post and Go machines in Post Office branches throughout the country. Perch, European Eel, Crucian Carp, Cadis-fly Larva, Arctic Char, Common Toad. As usual these will be available for 6 service-indicators, with a total face value of £6.42. At Autumn Stampex it is expected that these will be available from Hytech v2 machines. 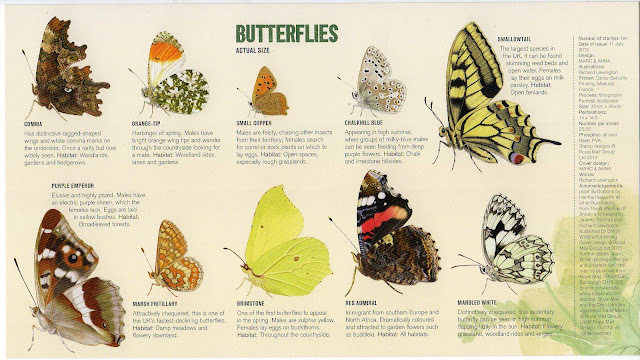 The 10 x 1st class Butterfly stamps will be issued on 11 July just before the National Butterfly Count campaign run by charity Butterfly Conservation. Row 2: Purple Emperor, Marsh Fritillary, Brimstone, Red Admiral, Marbled White. 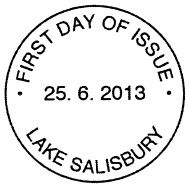 The 37 x 35 mm stamps will be printed in two sheets of 25/50 by Cartor Security Print in litho. The design agency is MARCandANNA. Royal Mail have sneaked into the programme another mixed retail stamp book: the Chalkhill blue and Comma will be issued in a self-adhesive booklet of 6 stamps with 4 x 1st class red Machin definitives which have code M13L MCIL. A very colourful set which ought to be popular. 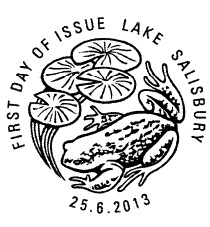 The 'Freshwater Life' No.2 Lakes may be at the Autumn Stampex but I think 'Freshwater Life' No.3 will be issued on the Friday of Stampex which has now become the normal think with Stampex. So will they have both issues? Yes, as has become the norm. The summer issue will be available from day 1, and the autumn issue will also be available from day 3. I'm basing my assumption on what they did for the Farm Animals. According to the Philatelic Bulletin the union flag post & go will be re issued on the 27th May for the 60th anniversary of the coronation. I too saw this piece in the Philatelic Bulletin and I was wondering how Post Offices will be open on the 27th May to be able to sell this re-issue of the Union Flag Post & Go stamp? To be honest I can't see the point of the Post & Go stamps, does anyone actually collects them. The point of them is that they save time and queuing at post office branches. That's why some larger offices have more than 6 machines, and many have 2 or 3. As to whether anybody collects them, yes very many people collect them, not only in this country but throughout the world. Machine-vended print-on-demand stamps are very popular in Europe and Michel publishes a worldwide catalogue which is over 1cm thick. Take a look on eBay, not just at what is for sale but what has actually sold.